Conserving and recycling are important things in our family. It’s why we consistently recycle most of our trash, conserve electricity as much as possible, and why I’ve cloth diapered and breastfed all my kids. It’s also why I love to upcycle things around our house that we’d normally throw out. 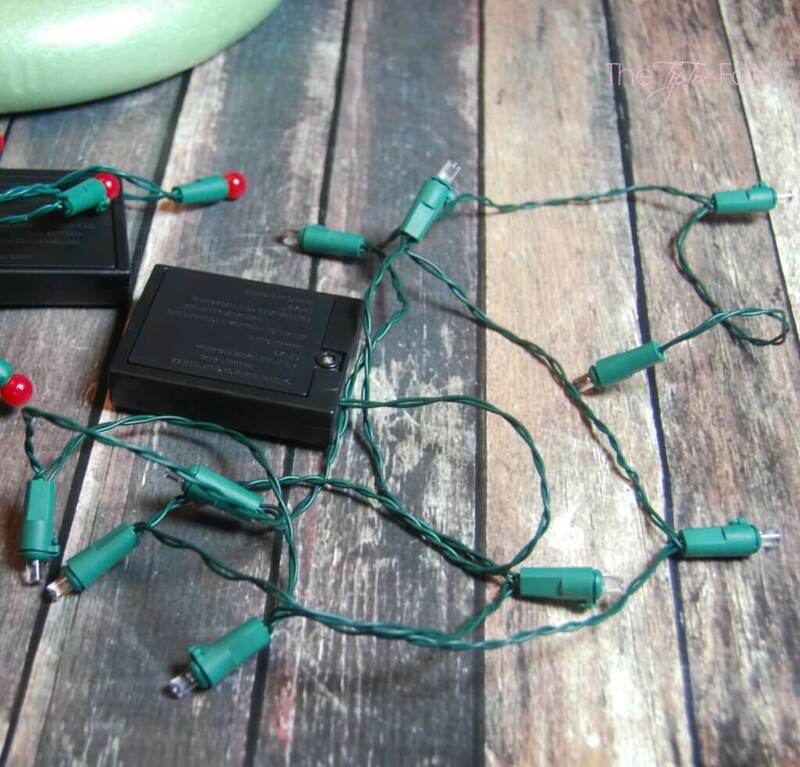 Today I have a fun home decor you can do with some old battery operated Christmas lights. 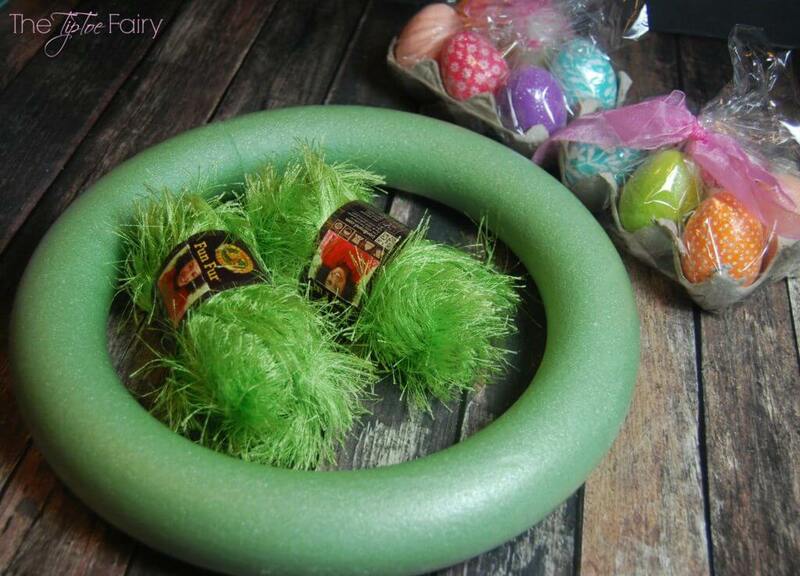 We’re making an Easter Egg wreath! You can check out a few other projects I’ve upcycled HERE. I had both red and clear lights, but I thought the clear would go better with the Easter wreath. These Christmas lights were actually used to decorate my teenager in a Christmas parade. Then, Nate took them to work to decorate himself. It was ugly Christmas sweater day, and since he didn’t have one, he wore a regular sweater and fancied it up with these. LOL! 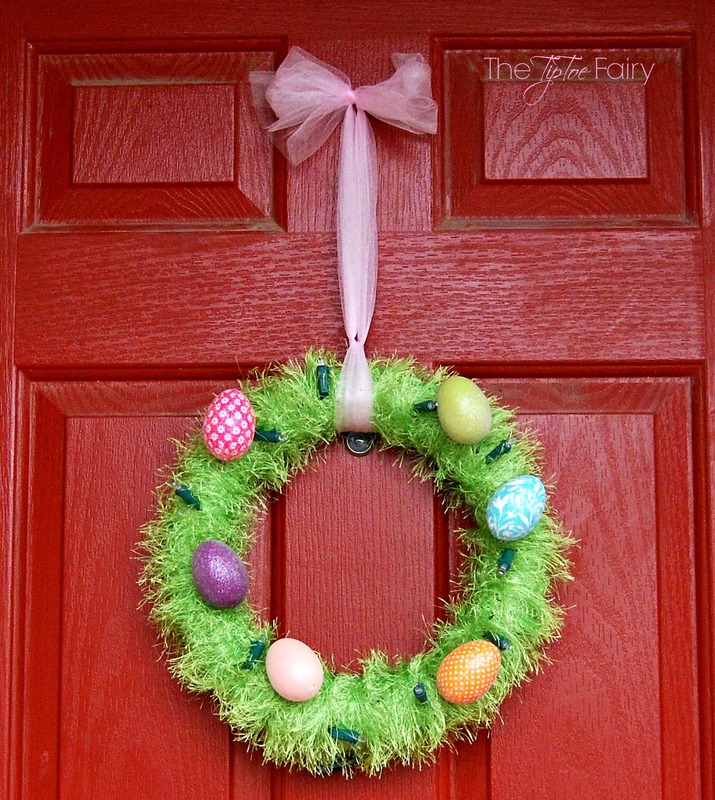 This is an easy and quick Easter Wreath Tutorial and you can do it yourself! Take the end of the string of lights and place it on top of the wreath and begin wrapping the skein of yarn around and around. Work your way around the wreath, making sure to put the lights around the wreath to wrap into the yarn to hide the wires. Once you’ve worked your way around the wreath, you’ll still have a few more lights. Just keep going around the wreath with the lights and wrapping the yarn until all the cord is covered. Tie off the yarn in a knot at the back of the wreath. Insert the zip tie down under a lot of the yarn to make it secure. At this point, you’ll have a few inches of cord down to the battery pack. Flip the wreath over and we’re going to zip tie the battery pack to the wreath. Wrap the zip tie around the battery back (make sure to leave the switch available), pull the zip tie as tight as you can, and cut the excess off. Flip the wreath back over and position the battery back so that it’s at the very bottom of the wreath, otherwise it will hang funny. 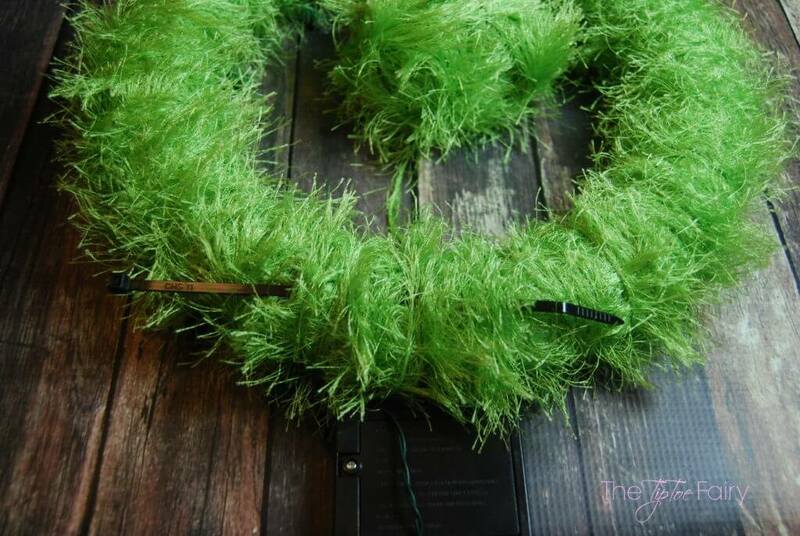 Take two yards of tulle and double fold it together and tie a knot at the wreath and make a bow at the top for hanging. 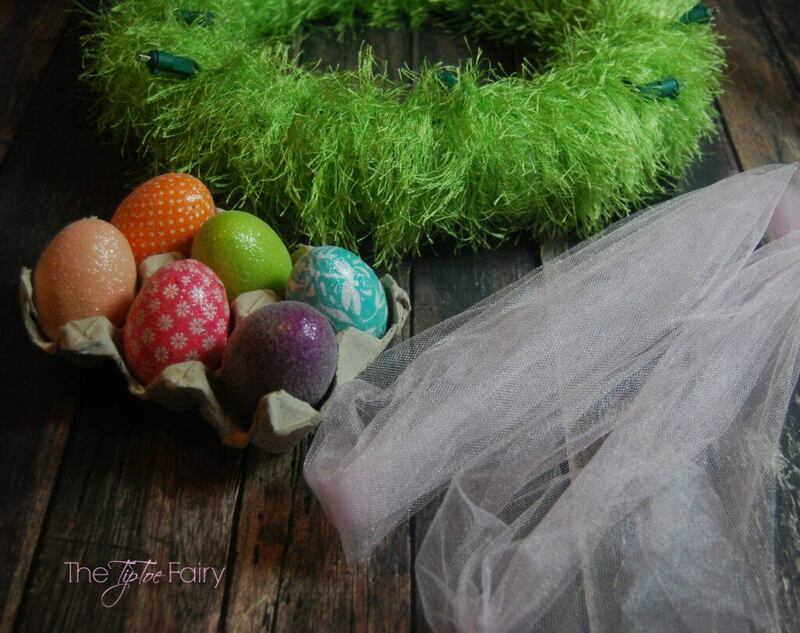 Now, use a glue gun to place Easter eggs all over the wreath. Hang your wreath and flip the lights on! Do you have a favorite project you’ve upcycled or recycled? I am not one to decorate, but this is a really good idea to upcycle. What a cute wreath!! Hopefully I will have all my Christmas decorations down by Easter! I love spring time! I think this is such a cute wreath. I’m loving the lights! This is a super cute idea. I don’t have any of those Christmas lights but I bet it makes it look nice at night. Very creative. 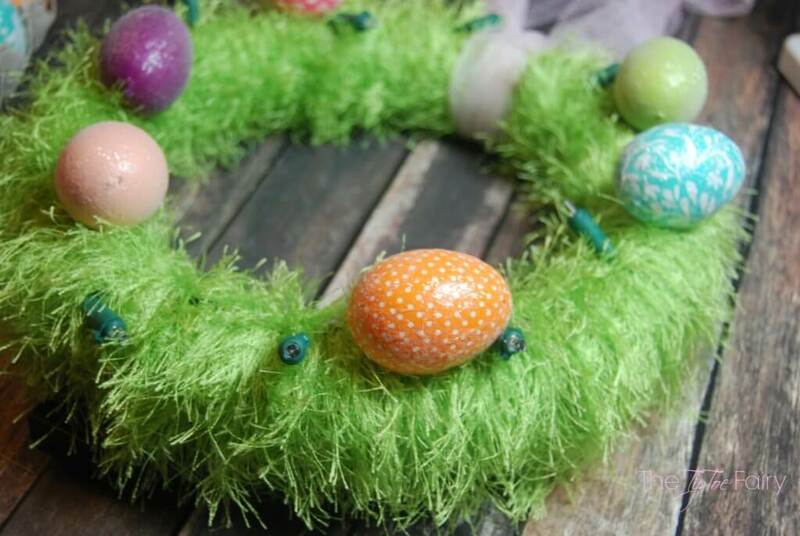 This is such a cute Easter wreath! I love it, and I love your red door too! This is too cute. I will need to pin it to my Easter Pin Board. Great easter decoratiion. Easy and crafty. This looks cute, I really love how it is so colorful and vibrant; perfect for Easter! What a great Easter wreath! 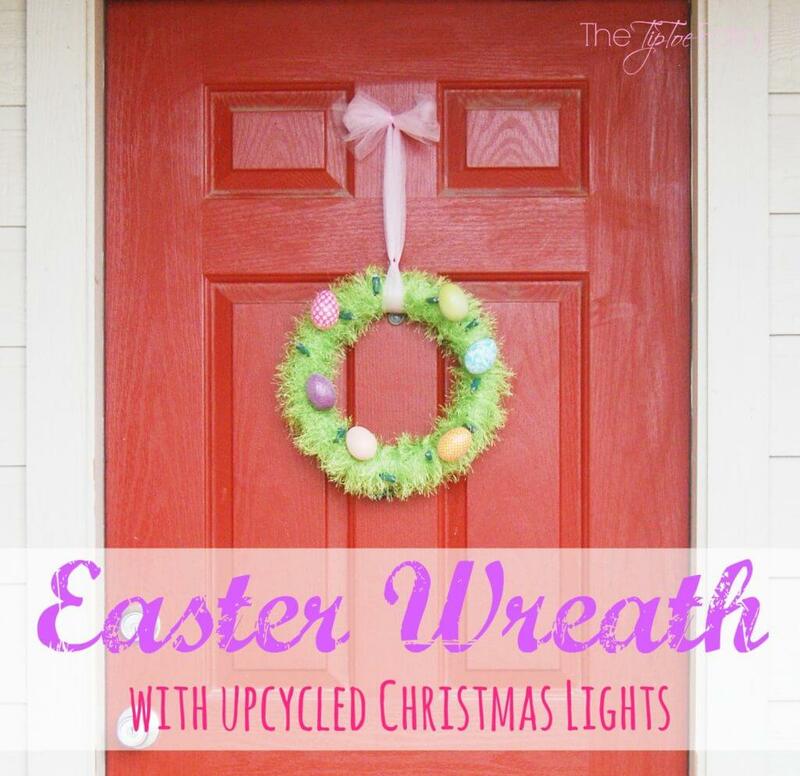 I would have never thought to reuse Christmas lights for Easter. You’re the bomb, girl. This wreath is so cute! I love the idea of having it lite up by using battery operated Christmas lights! OMG My girls would absolutely love to do this. To be completely transparent “I” would love to do this and would love if they would let me make my own while they share the work in creating one for themselves. LOL! 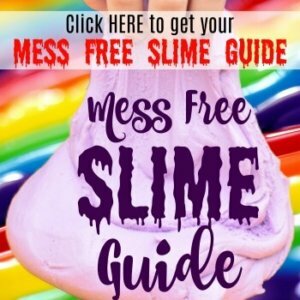 Awesome tutorial and very inexpensive. 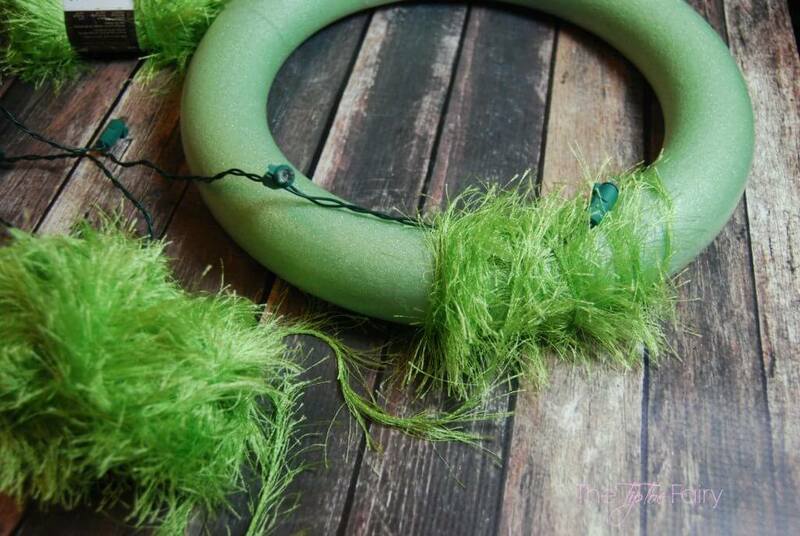 I love how the yarn looks like grass in your too cute Spring wreath! Such a great way to upcycle! Super cute! Way to recycle those lights! Great idea for using those Christmas lights all year long! I love creating and displaying seasonal wreaths. This one likes great! Thank for sharing. 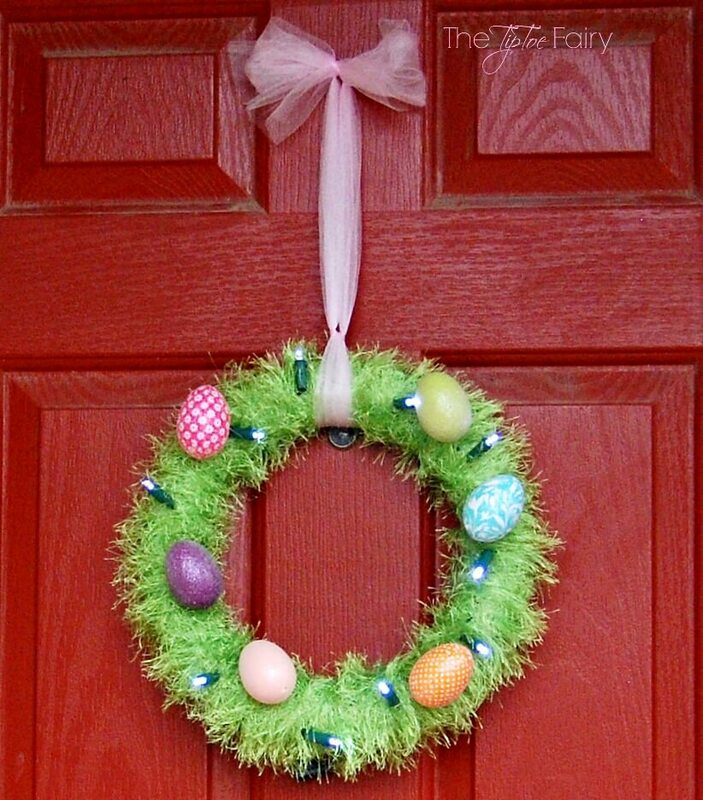 This is an awesome idea for a Easter wreath indeed. I love the fact that these batteries are recycled too. I have to make this wreath with the lights. Thanks so much for sharing and what a great giveaway indeed. I love this great idea. The wrath looks really good. Pretty good one for the Easter. It looks so beautiful on your gorgeous red color door. 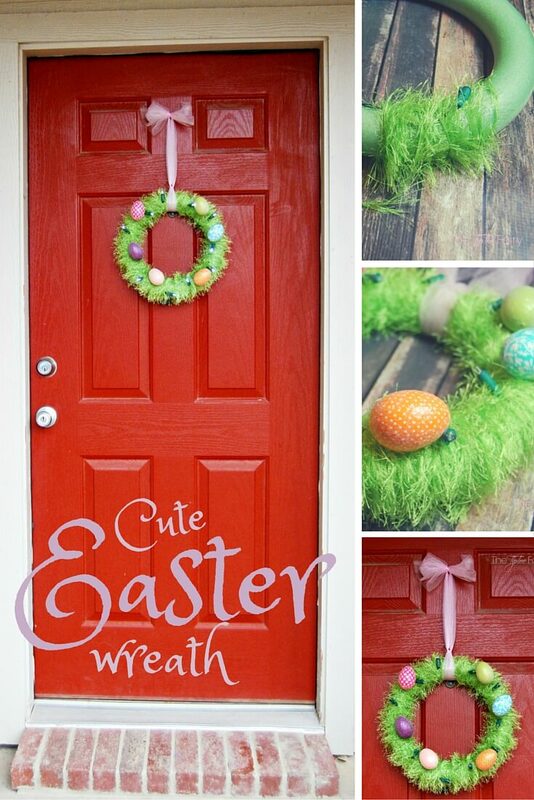 Your Easter wreath is so cute and such a great way to use things you already have! Thanks for sharing it at The Pin Junkie! It’s being featured today in a spring wreath roundup. My girls are gonna love that! Plus it looks like the perfect recycling project for them, because we already have the materials and they just have to re-purpose some stuff. We are planning not to buy any Easter decorations this year and to make everything we need out of old materials and items that we’ll reuse and renew. Thanks for the great idea!